Online web mapping for most people is still a relatively new concept; however it has actually been around now for many years now, long enough that a good majority of us now take it for granted. And like many other great products from our modern society there are always various versions or brands that tend to shine and become more popular than the others. They have evolved so much over the past few years that I am sure you have noticed that even more people have them with them everywhere they go via, GPS navigation units, net books, tablets, smart phones and other portable devices. And hopefully you have already discovered the web mapping section on CanadianGIS.com about the many great Canadian online web maps that are out (and grows every month) to help make our lives easier. I remember when I first started out in GIS, how it was always challenging to explain to people what I did for a living (and that I did not actually just make the road maps they bought at the gas station). Now days it has been much easier to explain to people what GIS is thanks to the rather recent increased knowledge about GIS and Geomatics due to more people using the basic free online mapping services like Google or Bing Maps. Therefore I thought it was time to look at perhaps the two most common free mapping services that most of use all the time to see, how they compare to one another and how they have evolved over the past few years. So I will start off with Google Maps since I am sure most of us have come across a map generated in google or a website using Google before. Google Maps is a web mapping service that powers many online map-based services, such as the main Google Maps website, Google Ride Finder, Google Transit, and embedded maps on thousands of websites that use Google Maps API. Google Maps as we know it know started off as a little C++ program designed by two brothers Lars Rasmussen and Jens Rasmussen from the company Where 2 Technologies. Originally it was a stand-alone program that you needed to download and was not a web based product like it is today. 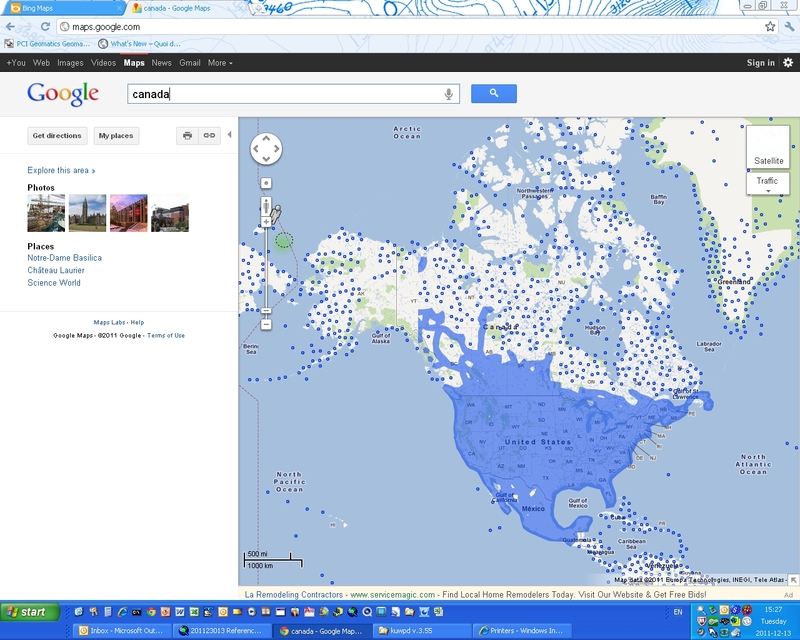 In 2004 Google acquired their company and then transformed the mapping software into an interactive web application. Google Maps offers street maps, and a routine planner that can be configured for the method you are traveling (whether it is by foot, car, bike, or via public transportation). It also has an urban business locator for numerous countries in the world. 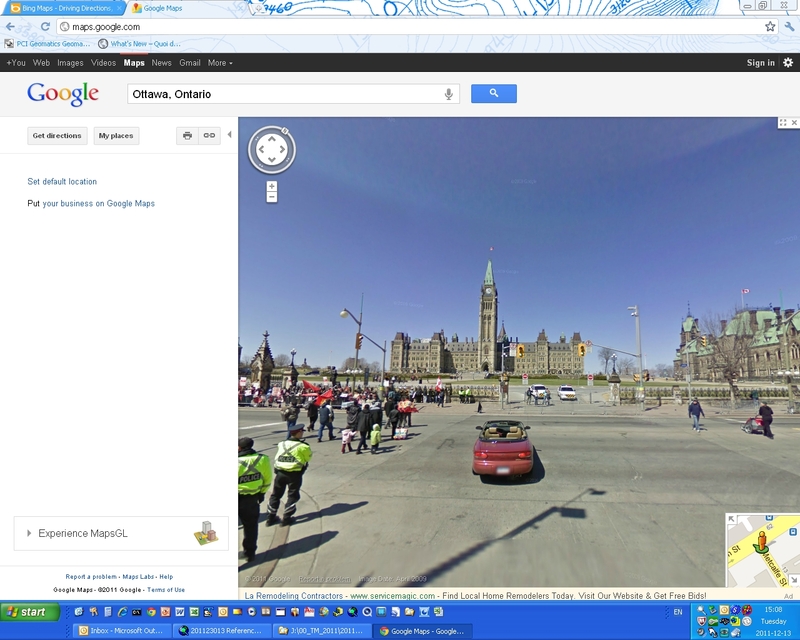 In 2007, they added Streetview, which provides users with a 360° captured view of streets in most major towns and cities. Basically a system was designed with multiple cameras that were mounted to the roof of vehicles that could capture data on all sides of the vehicles as the vehicle drove down the street. Some areas are obviously covered better than others, but the project continues so more areas are covered as time goes on. They also incorporate satellite imagery and aerial photography in many places as well (whenever data sets are available); with the ability to produce quick Hybrid style maps containing map layers, labels and imagery fused together into one mapping product. The Google Maps application has been pretty rock solid providing others the ability to show case their own mapping data without the need of purchasing high-end GIS mapping software. This is part 3 of the feature – Comparison of Free Online Map Sites ‘Bing Maps vs Google Maps’ that takes a closer look at Google & Microsoft’s web mapping services. Both have done a great job utilizing spatial database data to provide a better accurate search, although sometimes you may find one does a better job over the other in different areas (with no real reasoning of why). Also the more information you have to provide (e.g. adding postal code) in your search then obviously the better your results will be. Both map services offer driving directions that can be easily achieved by stating a start and end point. Driving directions that I have tested with both services were usually pretty accurate with estimated travel times based on mode of transportation provided by both has been pretty good as well. Imagery data sets for both services vary from place to place but overall it seems that Bing Maps uses newer and better quality satellite images than Google Maps does. Bing Maps images are generally about a year old (about 215 terabytes of high-resolution imagery to Bing Maps was recently added by Microsoft), where Google Maps images have an average of about 2 to 3 years old. 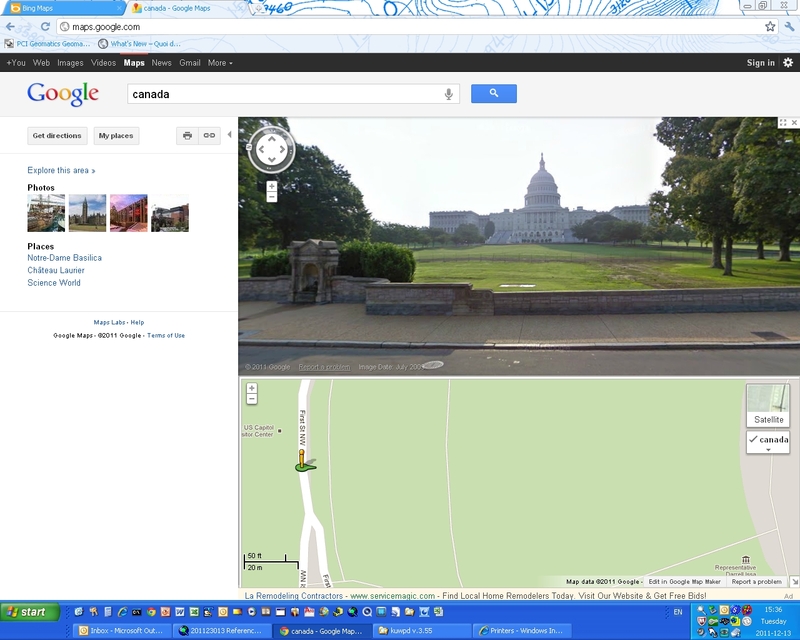 With Bing Maps, you can also zoom in closer than with Google Maps (if the data exists). 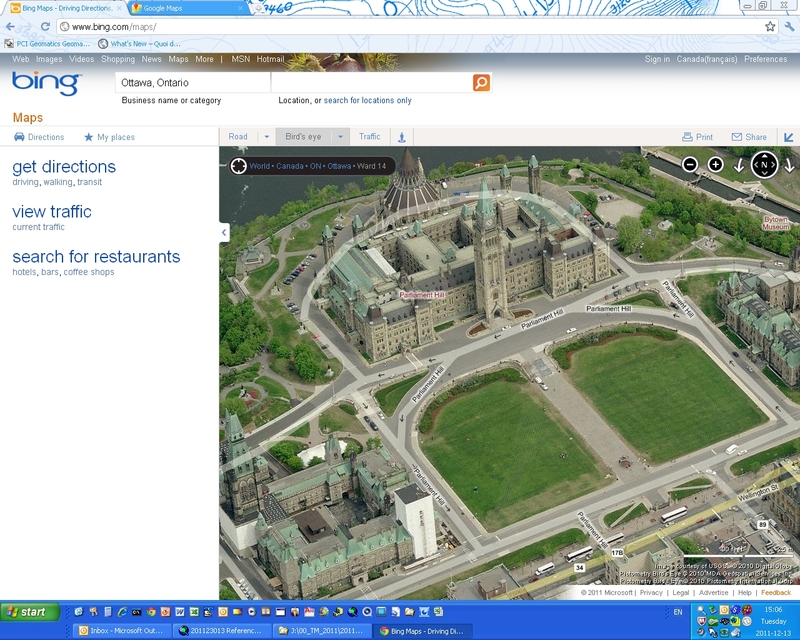 Bird’s-eye View of Bing Maps offers a 3D view of buildings in major cities (mostly in the USA) and many places that are not highly (like most parts ofCanada) populated will not have any higher resolution imagery and only basic larger scale Landsat data will be provided. Sometimes Google imagery does not flow well together, mixing dark and light data sets and some with clouds and other obstructions (usually a pet peeve for anyone who works in Remote Sensing) . However both vendors provide better imagery as they obtain it so aerial imagery in various areas is constantly changing. In a bid to keep up with its arch mapping rival, Microsoft is taking on Google Maps in the high-resolution space with a 215 terabyte update of Bird’s Eye imagery. 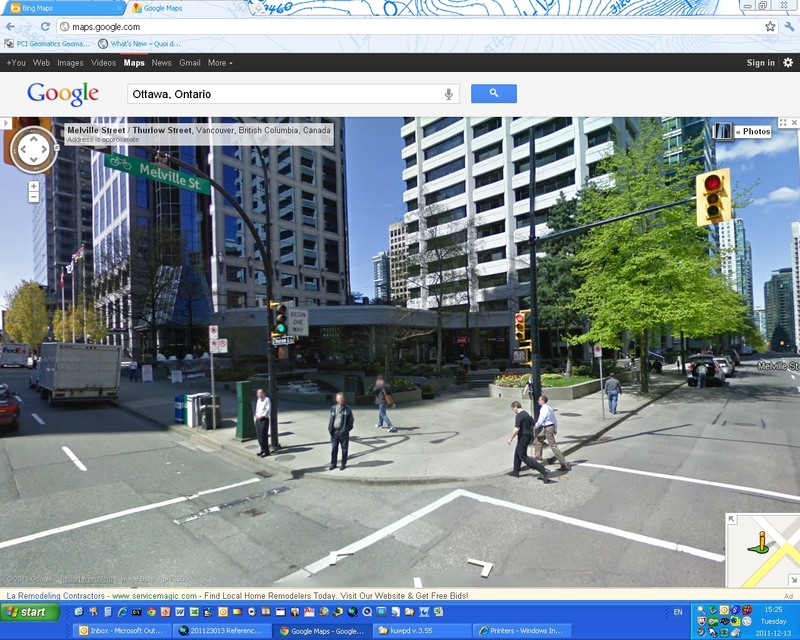 Both Bing Maps and Google Maps have street-level views, where there is a panoramic view taken from the top of a car and stitched together so it looks like you were standing there. 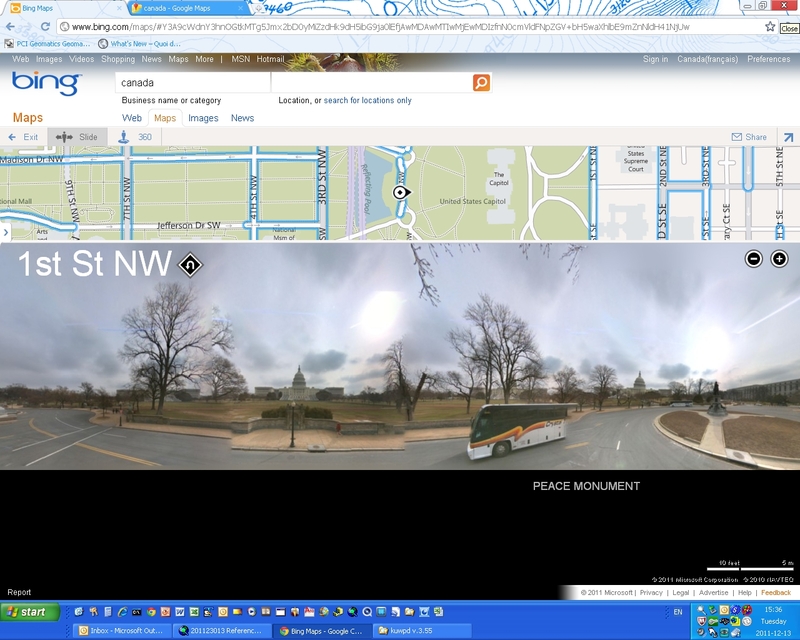 Bing’s “Streetside view” shots are clearer, with higher resolutions and more features (such as Flicker and Photosynth) integrated into the viewing experience. Bing’s Worldwide telescope integration is a feature that allows viewers to look up to view the night-time sky above them. Google’s streetview also has a “user images” feature that offers more photos than Bing does, but they are presented as a slide shoe, instead of being layered as they are with Bing. Google’s Streetview is worthy of an honorable mention because of the numbers of areas around the world that it has captured. 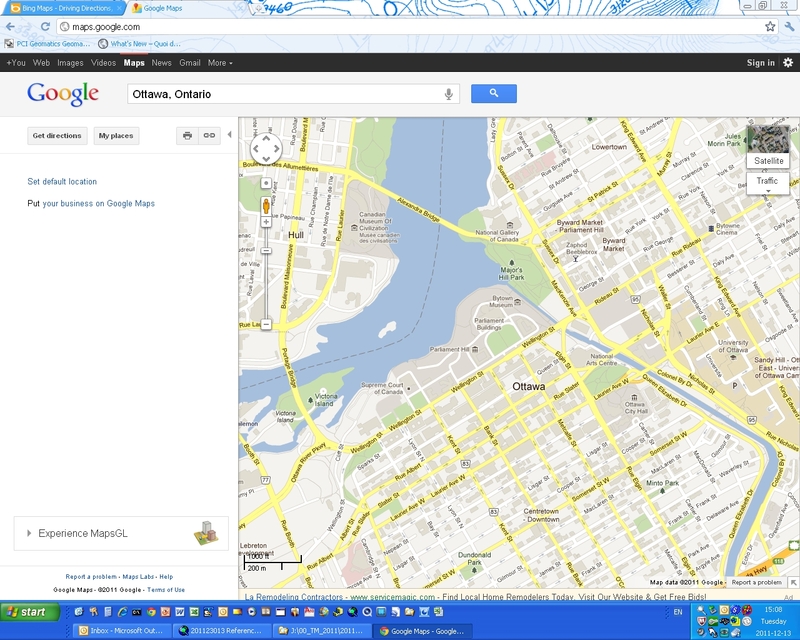 Both Bing Maps and Google Maps offer effective web mapping platforms with very similar yet unique features . Bing tends to have better features and tools integrated into it, and can operate smoother than Google Maps but their coverage of data in Canada is relatively pretty weak. Both have great features to offer but neither one seems to really fully out shine the other over all, witch in a way can be a good thing as these two web giants continue to go head to head providing us with more free web mapping tools to make our every day lives better. I myself tend to use Google Maps more perhaps out of habit from being a big Google Earth user, but can honestly admit I do go back and forth between the two mapping applications depending on what I am using them for. 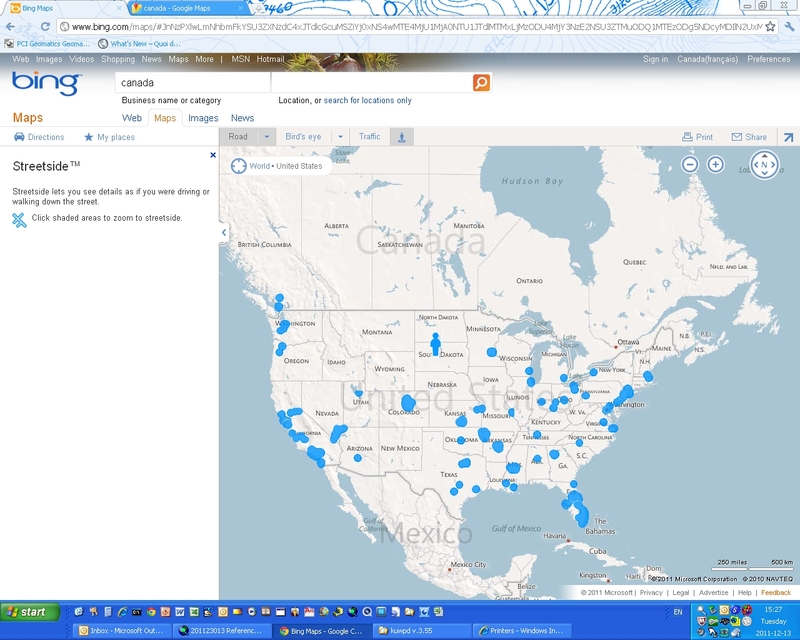 ArcGIS now offers Bing products as free base maps for ArcMap layouts so that certainly has increased my Bing maps usage. 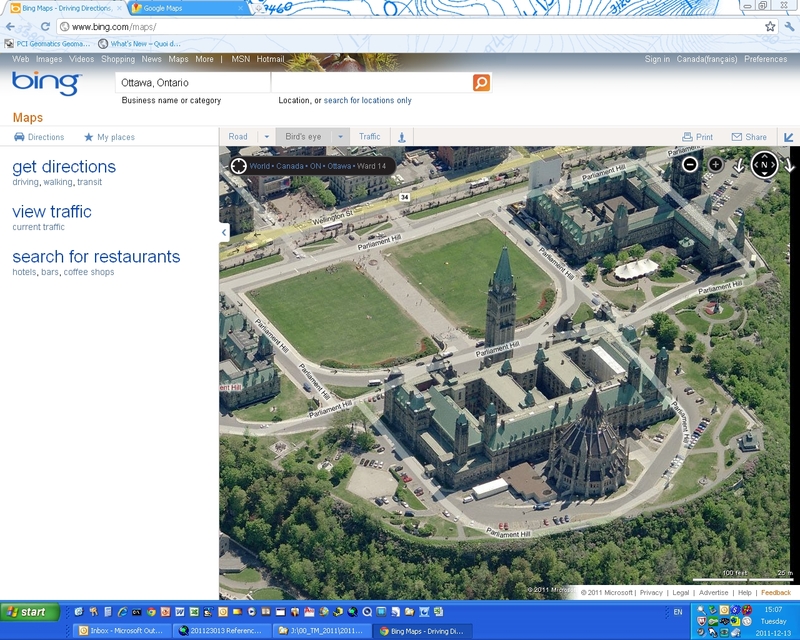 For example, I find that Bing does a better job of providing names of streets and rivers and the Bird’s Eye imagery always provides more than one view of an object (although not available for many places in Canada). And a lot depends on the imagery of data that is available in the area I am working with, so I tend to sometimes check both to see which one is better. And actually someone has come up with a web application that provides both mapping applications in the same window for times when you want to compare (http://www.jonasson.org/maps/). So go ahead and check out these two popular free web mapping applications and then leave some comments about witch one you prefer over the other. This is part 2 of the feature – Comparison of Free Online Map Sites ‘Bing Maps vs Google Maps’ that takes a closer look at Google & Microsoft’s web mapping services. Bing Maps is Microsoft’s web mapping service provided as a part of their Bing suite of search engines and powered by the Bing Maps for Enterprise framework. Originally called Microsoft Virtual Earth, the first version was released in 2005. In 2010 a fully overhauled design for the default view was launched as well as adding dynamic labels. 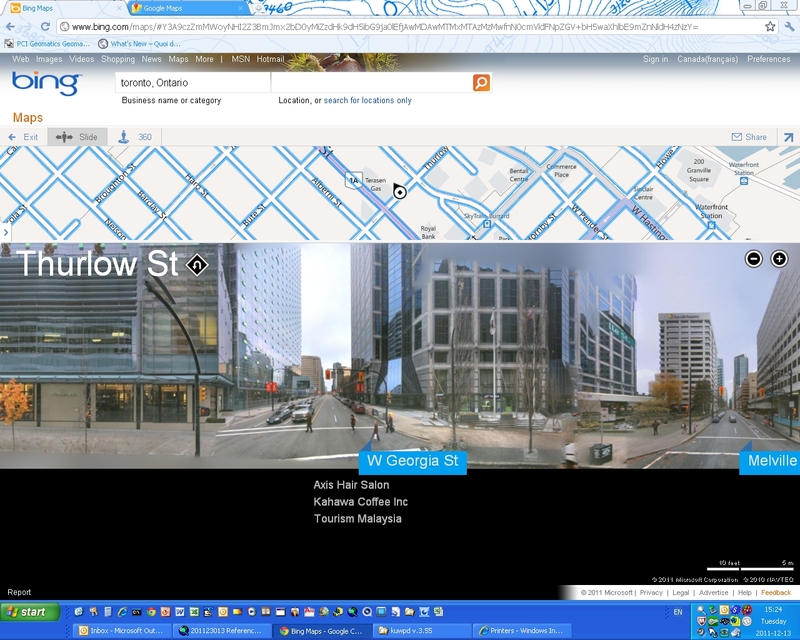 Bing optimizes the power of the Silverlight engine combined withAJAXto serve the map data into your browser application. It offers street maps, featuring road view, aerial view, bird’s-eye view, streetside view (with geo-tagged photos from Flickr and Photosynth integration), and 3D view (as an add-on), driving directions, and several different map apps. The Bird’s Eye imagery feature provides end-users with high-resolution, oblique look angle imagery in four different look-directions providing a different visual context appealing to many spatial tasks. This neat feature allows you to look at an object from one angle and then spin your screen around and see the same object from a different perspective. Bing Maps provides traffic information and ClearFlow traffic data, as well as allowing users to share maps and embed them into their websites. Other features include people, location, and business search functions, and satellite imagery (“Bing Maps,” 2011; Pike, 2010).